Fish is my favourite form of protein. As a child I loved fish so much that I would stand on my balcony and call all the fish-walis that came to our colony to sell fresh fish. After they climbed two floors to answer ‘baby’s taali calling us’ my mom was obliged to buy from them – that is until I was banned from standing at the balcony once mom figured out my antics. Fast forward to the future, the other day I was delighted as the fish wala uncle stopped by at my home in Dadar and my mom-in-law managed to get us a great deal on some Rawas. Eagerly wanting to try out a new recipe I pulled out the Katy Dalal recipe book I received in my dowry and chanced upon Soonamai’s Malai ma Kolmi. 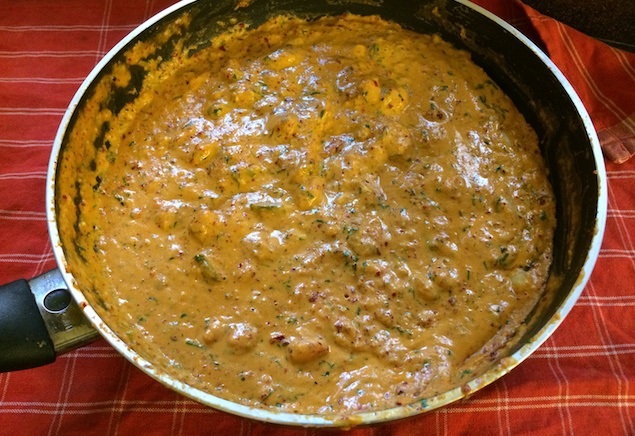 Apparently, Soonamai was Katy aunty’s great grand mother and this recipe has been adapted from her time in Tadgaon, Gujarat. Since I didn’t have any prawns I decided to try out the recipe using my Rawas and it turned out fabulous. In hindsight, I’d stick with the prawns or use a firmer fish like pomfret as my rawas was too soft and had to be cut into smaller pieces while serving up. Ingredients (with the prawns) below as usual. To make this dish, marinating the fish is an important first step. 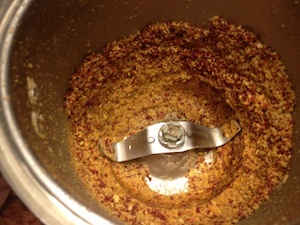 Therefore, you need to grind the cashews, peppercorns and red chillies into a smooth paste for the marinade. Now, wash the fish and rub the marinade as well as some salt making sure to coat all sides. 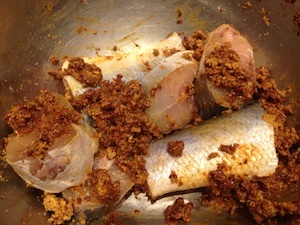 Let the fish marinate for about 15 minutes before proceeding to the next step. In the meanwhile, finely chop the onions and green chillies. 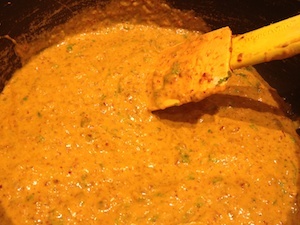 In a non-stick pan, heat the oil and when it starts smoking, lower the flame and add the onions, chillies and jeera. Lower the flame further and drop the fish into the pan stirring carefully to ensure the fish doesn’t break. 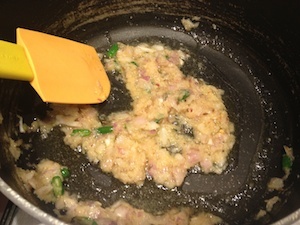 Add about 3 – 4 tablespoons of water and cook on a low fire till the fish is soft and tender. If necessary add some more water. 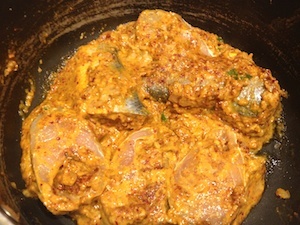 Once the fish is cooked, give the cream a good whip and pour over the cooked fish. Bring to a gentle boil and then remove from the flame. Garnish with coriander and some more fresh cream. Serve it up with some hot chappatis or with yellow khichdi while its hot. Good one perz. Keep the blog active n some day this Bawi bride will become an owner of a fine dining place. Keep in mind, the love n peace n honesty n integrity in this business always. looking forward to the end result… will keep you updated. After days and days of deliberation over which recipe to try first from your blog , I decided on this one. I used sole fillets cut into smaller pieces and it was divine. I have had my share of parsi food but nothing has come close to this. 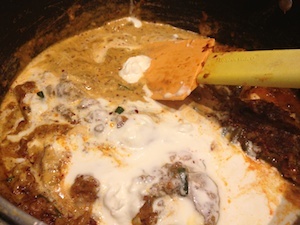 Creamy and spicy and rich in equal measures ; I made it for Sunday lunch and my parents gobbled it up in a flash. Big BIG hit. need to to try all your other recipes now.